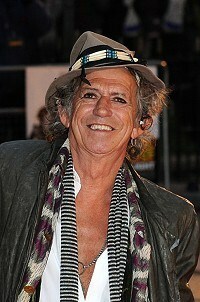 Rolling Stone Keith Richards has credited Johnny Depp as "the engineer" behind his appearance in the new Pirates Of The Caribbean film. The rocker reprises his role as Captain Teague in the fourth part of the hugely successful series, called Pirates Of The Caribbean: On Stranger Tides. He said: "Johnny was the engineer. He said to me 'Are you in?' and I said 'Just give me the rig, baby'." "It's so much fun," he added. Depp, who described the guitarist as "a fascinating man", famously based his portrayal of Captain Jack Sparrow on the hard-living star. Richards also impressed the film's director Rob Marshall, who said: "After we shot his scene, I said 'Keith, that was fantastic. I'm so impressed' and he said slyly 'You should see my Hamlet'." The film also stars Penelope Cruz, Ian McShane as the fearsome pirate Blackbeard, Sam Claflin, Richard Griffiths and Stephen Graham. Stephen, who recently appeared as mobster Al Capone in HBO's Boardwalk Empire, relished his role as the sailor Scrum. He said: "I kind of think of Scrum as being like the Artful Dodger of the pirate world, always looking for something to do, always with his hand in something. "He's always looking for another way to make more money, or go on another adventure. Scrum is a great, fun character to play, and after playing a few psychos lately, it's great to be able to let all that go and really enjoy myself." Pink Floyd stars Roger Waters and David Gilmour teamed up for a rare appearance together to restage classic album The Wall. Jedward have made it into Saturday's Eurovision final.The Irish twins impressed enough viewers of the second semi-final to become one of 10 acts to make it through to the final 25. Pink Floyd stars Roger Waters and David Gilmour have teamed up for a rare appearance together to restage classic album The Wall. Tinie Tempah used his showbiz connections to arrange a meeting between his mum and her musical idol - Dolly Parton. JLS star Oritse Williams has said that the band would be happy to join the X Factor line-up as mentors this year. Ex-Pink Floyd star Roger Waters has staged his monumental concept album The Wall, live in the UK for the first time in more than 30 years.